FOODCOIN Ecosytem blockchain is growing and getting functional. More so, there are food producers who already start to implement it to improve the traceability and visibility of their supply chain. The first one is our partner, ALDIM GmbH. 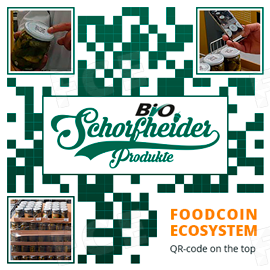 Its products, pickled cucumbers and sauerkraut can be found and tracked in FOODCOIN blockchain by scanning QR codes on the jars and caps. We talked to owner and CEO of ALDIM GmbH Mr. Alexander Schnekenhaus, and he gave us his comments about his first lot of preserved products on blockchain. What should be done to insert the information into the blockchain? I will explain it in simple words: We are looking for the correct way to digitalize our business. Adding our products to FOODCOIN blockchain is the first step on this way. I believe that total transparency and efficiency are the future features of the whole global food industry. We are trying to be on the head of this process. How will the customers understand that the information about the product held in his or her hands can be found in the blockchain? FOODCOIN proposed us the easiest method how to add our products to blockchain. We don`t need to use any complicated and expensive devices which will lead to increasing the costs of our products. We just use FOODCOIN Ecosystem QR-code. Now any customer can just scan it with standard QR-scanner and see ALDIM products on blockchain. How much of such products were produced? Which countries the QR marked lots are going to be exported to? We produced nearly 100,000 jars of pickled and when the season comes, is planned to be produced in about 120,000 jars. Our main market is Germany, because it is experiencing a deficit in bioproducts. We also export some quantities to Spain. But we already have requests from customers from other countries, we will be glad to export it too. There are other clients which are getting interested in it, such as Austria, United Kingdom and others. Which outcomes do you expect to get from this innovation? We expect that blockchain is a future of food market. I believe it will help us to digitalize our business, to show to our customers and partners our current vision and direction to future development. It`s very important because ALDIM is going to extend the business and trading of bio products all over the world. Which opportunities for improvement do you see in implementing the blockchain into supply chain? Ultimately, it will give us the opportunities to improve risk management. I think so because blockchain is the best way to create sustainable (stable) supply chain. Visibility and traceability will allow to reduce the stocks, improve procurement planning and cashflow. Customers, partners and governmental authorities as well will have all access to ALDIM`s data. FOODCOIN blockchain will help us to reduce working capital and finally to become more attractive for investors. The technologies are integrating to the real life and help to improve it. The pickles and sauerkraut with QR codes for checking will soon be available at the stores. But these are not the only products customers will see, and soon their variety will keep growing. Other producers are also planning to implement blockchain into their toolset to improve the traceability and visibility. I hope this step is going to be great for the customers which will be confident of the information they see. ALDIM does not plan to stop on that. Starting from the next year, ALDIM plans to transfer its document flow to the blockchain to reduce the administrative costs. In addition, FoodCoin blockchain gives a unique feature for the producer to contact directly with end customers. This is a valuable possibility to have a direct feedback. We are going to implement this tool into our business model and we also recommend this system to other manufacturers.